Encashing the economics of cotton for global prosperity. This will be done by contributing towards sustainable development of cotton supply chain impacting each segment- farmers, ginners, manufacturers, investors & government and promoting the utility of cotton as the most natural, sustainable, eco-friendly renewable resource. 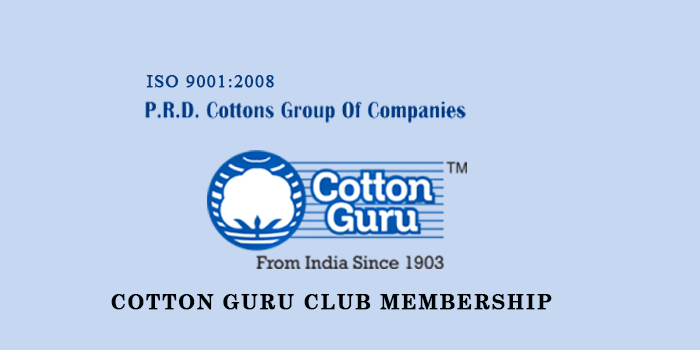 COTTONGURU® is the leader in cotton advisory services across the country. We are in cotton industry since 1903 and have strived hard to reach this leading position. Our vast experience of working with the smallest of farmers and top most consumers, DNA of technical and Marketing expertise and in house cotton testing laboratory has given us a clear edge over our competitors. We will continue to contribute to the value addition of cotton in every possible manner. “I am highly amazed to go through one copy of your highly reputed fortnightly Newsletter, it is really a resourceful cotton newsletter, I wish your continuous success. I hope I shall enrich my knowledge if I shall get your news letter regularly through Email.Look forward for your early response and appreciate all of your efforts. “It's always great, getting overall information from the bulletin board of Cotton Guru which is proven a healthy & reliable source of market idea. We appreciate your article & matters covered thereunder. “Congratulations for publishing Fortnightly news letter ,”COTTONGURU®”. This is very informative & will help to all concerned to update themselves.My best wishes! “Congratulation on bringing out such a informative and pictorial issue. Continue the effort. Put us on your regular mailing list. We will also be dispatching you our Monthly M P Textile News Letter. “I have gone through your fortnightly news letter ' Cotton Guru® '. It is quite interesting. CONGRATS. The format is quite different than other textile news papers, which I like. Give some news about gininng research, and development in India and abroad. For this Keep contact with CIRCOT, Matunga, Mumbai. Wishing ' Cotton Guru® ' a Good Luck. “Thanks for rembering us and say special thanks to Shri Manishji Daga. “My opinion about mission of COTTONGURU TM to take feedback from various systems, industry, trade and Government agencies ids helping the entire cotton value chain and it will allow share authentic information which helps industry and trade will be increased. “I was very impressed by the work you are doing and I think its very worldwide effort of being together of different segments of supply chain. The work you have been doing has great impact on industry.